So what really makes Sphero stand out? I have used many robotics kits, and Sphero is the one I keep returning to. My top two reasons? Their products are approachable for all students and bring versatility to the classroom. I run an afterschool STEM program where I work with 6-8th graders (yes, all in one room) that have widely different skill set levels. Some have been in robotics club since elementary school, while others have never even seen a robot. And with the Sphero robot, I can have students learning to drive the robot or advance to using block coding to program the robot through a maze. The new BOLT, really highlights the versatility, because not only can you do basic programming, but you can also use it to create animations, use as a light sensor in a project or create a game - the possibilities are endless! Draw - The Draw choice is great way to introduce robotics to elementary students. You draw a shape in the app, and the robot will follow that shape outline. Block - Block programming is similar to what you would see on Hour of Code or Scratch and is geared more towards middle and high school students. In the updated app, they have now streamlined their blocks with Scratch. To my horror, I once had someone throw a SPRK+ on asphalt (they thought it was a toy ball). I was 100% sure it was broken. However, there was no damage, and that same robot is still working to this day! We also use these robots at family nights that reach thousands of people a year, from preschoolers to high school students. Amazingly, the original 12 we bought two years ago are still going strong to this day. Yes, they are waterproof. Besides making them more durable, there are many possibilities here! Traveling between schools, I love that these robots are compact. SPRK+ and BOLT both have a hard spherical shell about the size of a baseball. So for anyone that has a mobile classroom, these are great for carrying from classroom to classroom. Sphero offers an education pack (available for both SPRK+ and BOLT), that’s basically a charging suitcase! So you can plug the suitcase in and charge all the robots at the same time, while having a super cool way to carry them. The new BOLT education pack can carry up to 15 at one time! Another thing I love about their design is that you don’t need to actually build the robot before you can start jumping into the programming. These robots are ready to be used right out of the box, so you can spend more time teaching computer science rather than picking up building pieces all over your classroom floor. Are you ready to start using Sphero in your classroom or program? 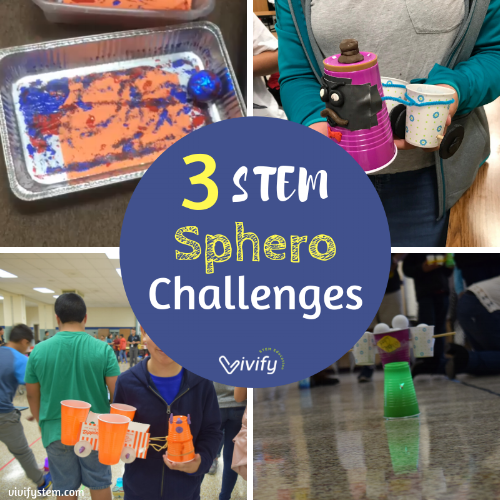 Here are three fun STEM activities to keep the ball rolling in your classroom. These can be used with both SPRK and the new BOLT. In a summer camp, I used Sphero to have the students make robot powered boats. The goal was for the robot to carry a boat full of pennies across the water. This is basically a chariot challenge in the water, and you can connect to real-world tug boats. A little messy, but a lot of fun! Check out some examples here. During STEM Family Nights, families love driving Sphero robots around an obstacle course to learn the basics of controlling a robot. Another popular station is a STEM mural, where students draw something related to a STEM career. To mix things up this year, we decided to merge the two activities to let our robots create the mural! This fun activity is inspired by the work of artist Jackson Pollock, who was known for his abstract ‘drip style paintings’. You’ll be using the Sphero robot to paint across the canvas and the result is very similar to what Pollock painted! For this activity, I would suggest buying rubber covers for your robots. My favorite ones are here. Once the Sphero is in the rubber cover, wrap it in Press n’ Seal wrap just for extra protection from the paint. For the canvas area, use butcher paper and then create a barrier around the canvas to prevent the robots from escaping and painting the floor. Ideas for creating a barrier include long wooden planks, pool noodles, and even hula hoops! I decided on large plastic bins for a portable solution that is easy to clean. Place the butcher paper inside the bin and add about a quarter-size of paint along the edges of the paper. Students drive the Sphero through the paint and across the canvas! You can check out some cool videos of this in action here and here. In Space Club, we added a space twist to the usual STEM chariot challenge! For this activity, instead of building just a chariot, students will build their own lunar rover. The goal of the challenge is to create a chariot that can carry as many ‘astronauts’ (ping pong balls) as possible and reach the finish line first! This activity took around an hour. You can access the challenge handout with design constraints in the locked “Vivify Resources” section. Subscribe to the Vivify blog to gain access! For this activity, we gave each group of 3-4 students, one 18 oz cup. The cup fits perfectly over the SPRK+ and BOLT. The challenge was to attach items to the cup to be pushed by the robot. Additional building supplies included wooden dowels, hot glue, modeling clay, foil, pipe cleaners, Popsicle sticks, construction paper, card stock, and cardboard. When the Sphero moves it spins as well. So whatever is attached to the cup will start spinning causing ping pong balls to fall out. Ping pong balls are very light, and driving too fast may cause them to pop out. After the testing, allow the students go back and re-design their chariot. At the end of the building time, we had all the teams compete against each other, and it was so popular that we even had students and teachers ask if they could stay later to continue racing! Check out this clip from a recent chariot challenge in Space Club Family Night! 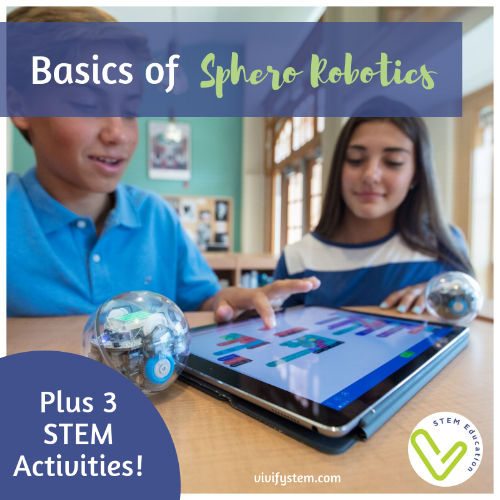 We hope you have fun incorporating Sphero robots into your STEM program! Stay tuned for my next post that explores the differences between Sphero SPRK+ and BOLT plus even more STEM challenges! *Vivify is a participant in the Amazon Services LLC Associates Program, an affiliate advertising program designed to provide a means for us to earn fees by linking to Amazon.com and affiliated sites. This post contains affiliate links. Aspen is a mechanical engineer and runs an after school Space Club program in San Antonio, Texas. Aspen was selected as an official Sphero Hero for her innovative use of Spheros in the classroom. You can follow her on Instagram or Twitter for more STEM ideas! Newer PostBolt: Is Sphero's Latest Robot Worth the Hype?